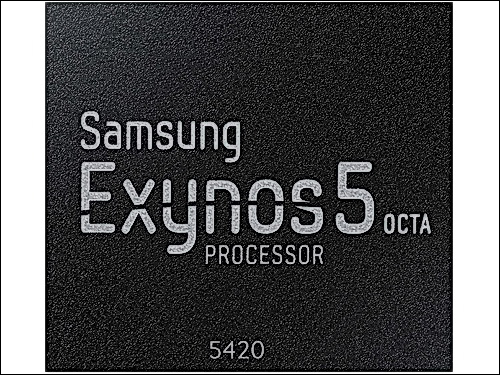 The Samsung Exynos 5420 Octa (also called Exynos 5 Octa) is a system-on-a-chip (SoC) for smartphones and tablets. It was launched in mid-2013 alongside the Samsung Galaxy Note 3 and features four Cortex-A15 cores clocked at up to 1.9 GHz. Furthermore, there are four additional Cortex-A7 cores at up to 1.3 GHz, an ARM Mali-T628 MP6 GPU and a 2x 32 bit LPDDR3(E)-1866 memory controller up to 14.9 GB/s. Compared to the commonly used Cortex-A9 and Cortex-A7 architecture, the A15 cores offer at least 50 percent higher performance per clock, which makes the Exynos 5420 one of the fastest ARM SoCs of 2013. On average, the CPU performance is roughly on par with the Qualcomm Snapdragon 800 or Nvidia Tegra 4. In addition, Samsung has integrated four Cortex-A7 cores clocked up to 1.3 GHz. Depending on the system load, the SoC will automatically switch between the more powerful A15 cores and the more efficient A7 cores to improve power consumption and battery life in a concept Samsung calls big.LITTLE". In contrast to the previous Exynos 5410, all eight cores can be used simultaneously, so that the chip can be described as the first "true" octa-core SoC in its class. The Exynos 5420 integrates a Mali-T628 MP6 GPU, which offers six shader clusters clocked at up to 600 MHz (115 GFLOPS). The Mali-T628 supports OpenGL ES 3.0, OpenCL 1.1 and DirectX 11 and offers a performance that is just sligthly behind the Adreno 330 (Snapdragon 800) or a PowerVR G6430 (Apple A7). Thus, the GPU is one of the high-end solutions as of 2013 and can run even the most demanding Android games at high resolutions (up to 2560 x 1600 pixels) and detail settings. The Exynos 5 Octa should have an estimated maximum TDP of about 3 to 4 W on a smartphone. It is possible that sustained load will lead to throttling of the CPU or GPU, especially in smartphones.